Remastered from the original tapes! They sound incredible!! Not everything that crosses our desks is recommendable for everyone. These are! It's just that simple. We've heard the test pressings for these landmark titles, and we can say that without question you'll be blown away! Neil Young's second solo album, 1969's Everybody Knows This Is Nowhere cracked the Top 40, went platinum and included three of his most beloved songs, "Cinnamon Girl" and the nearly 10-minute epics "Down By The River" and "Cowgirl In The Sand." The album also introduced his associated band, Crazy Horse. 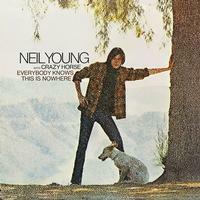 Released just four months after Young's solo and self-titled debut, Everybody Knows This Is Nowhere is a much more confident, less-restrained, livelier set. Much of the credit for that style change of course goes to Crazy Horse, the Los Angles trio previously known as The Rockets of Danny Whitten (guitar), Ralph Molina (drums) and Billy Talbot (bass). The band fuels Young on a looser, guitar-heavy approach. Everybody Knows This Is Nowhere went Gold within a year-and-a-half of its release and has since gone Platinum. GOOD NEWS: THERE'S MORE! Also reissued from the original analog master tapes in this same meticulous fashion are Neil Young, After The Gold Rush and Harvest. Don't miss any of these classics. Great music and the best fidelity I have heard on a Neil record. I would like to hear his catalogue in 24 bit 192 Hz on blu ray. My DVD-A's of Neil showed they were not up to par with his analogue mastered vinyl, but I have not heard his blu ray box set. This is one of the true classics of rock music. If I was teaching a course in Rock, this album would be required listening. This particular reproduction does justice to the music. As the gentleman before me said, “Play it loud!” I bought this because Down by the River is just about the most perfect song I have ever heard that features the interplay of three guitars. This is synergy at 33 and 1/3.